Friendship Tails: Spring puppies and kittens! Spring is my favorite time of the year for many reasons but it is the influx of adorable new puppies and kittens into the hospital for wellness care that really brightens my days. If you are looking for a feline family member, this is kitten season and the shelters are overflowing with these tiny little balls of fur. Bringing a new pet into your house can be overwhelming so I have provided a cheat sheet with the top three things you need to focus on to have a healthy and well adjusted new friend. 1. Bring your new pet to the veterinarian right away – All puppies and kittens should come with a health record of vaccines and de-worming medications administered by the breeder or shelter. On your first visit be sure to bring this paperwork, so you and your veterinarian can discuss and plan out an appropriate vaccine schedule. In addition, a poo sample is helpful so your veterinarian can make sure your new buddy didn’t bring home any unwanted friends (internal parasites) with him. At this first visit you can also get him started on preventives for heartworm, fleas and ticks – kittens too! 2. Take your puppy to basic training class – All veterinary behaviorists agree that early socialization is a crucial step in creating a happy and well-adjusted dog. Exposure to other puppies, new people, and places can help prevent your puppy from being fearful and socially awkward. The critical time period is in the first three to four months of life, which is when sociability outweighs fear and they are most open to new experiences. Puppies need to be taught how you want them to behave; a training class will give you proper guidance and a safe environment to achieve this. You do not want to let your puppy loose in a dog park until he is fully vaccinated. This potentially exposes him to unvaccinated dogs carrying diseases such as parvovirus and distemper virus. A puppy class or play date in a clean environment with a fully vaccinated, healthy dogs lets your puppy meet new faces while minimizing the risk of disease. I offer a free monthly class called The Polite Puppy on the last Sunday of every month. We discuss teaching manners and recommendations for wellness care to get your new puppy off on the right paw. 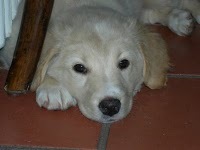 You can visit www.thepolitepuppy.org for more information or you can email me if you are interested in joining us. We meet at 3 pm at Happy Paws on Wisconsin Avenue in Tenlytown. 3. Spay or neuter!! – I cannot stress the importance of this enough. In my opinion, spaying or neutering is the single best thing you can do, not only for your own pet but also for the millions of homeless animals living and dying in shelters. In this country we euthanize around four million dogs and cats every year due to overcrowding in shelters.